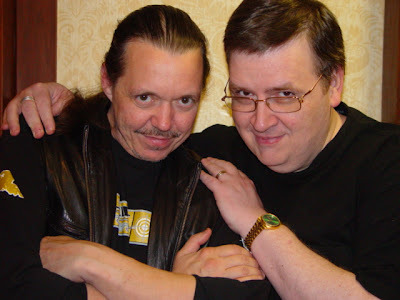 There were many highlights of Wonderfest 2007 but, for me, the most important was finally meeting in the rapidly corrupting flesh David J. Schow -- OUTER LIMITS authority, Robert Bloch authority, the Godfather of Splatterpunk, BLACK LAGOON BUGLE publisher, and VW contributor extraordinaire. 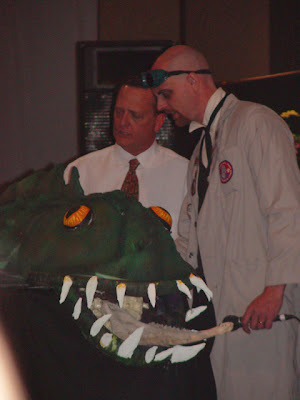 Dave suffered a tragedy just before leaving for Wonderfest, the death of his 15 year-old pet iguana Mr. Hate, but, ever the professional, he proved a buoyant addition to the roster nevertheless. As you can tell from this photo, snapped on Monday morning just before our departure, we're now firm friends for life. VW readers will be glad to know that Dave has already turned in a full report on the second season of THE WILD WILD WEST. I don't remember the precise issue but, somewhere along the way, I reviewed Dave's book THE OUTER LIMITS COMPANION in VW. When I handed my copy of the book over to him for signing on Saturday -- the day we met -- he embraced it because it was the copy that inspired my "review of love." I'm so glad Donna snapped this. What a character. 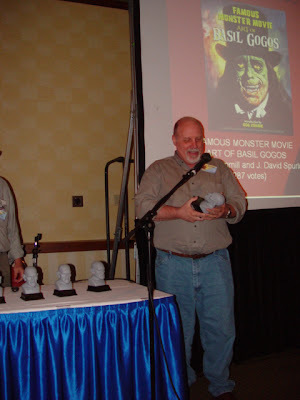 Here's the Heart and Soul of VIDEO WATCHDOG (right) posing with the Heart and Soul of Wonderfest, Mr. Bob Burns -- who presented a terrific slide show tribute to his late friends, '50s monster makers Paul and Jackie Blaisdell, on Saturday. 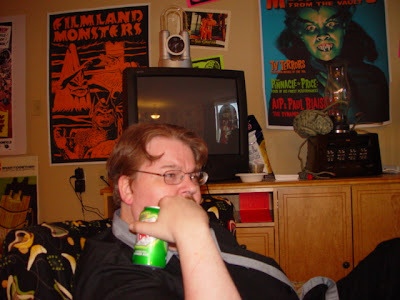 It culminated in a rare screening of Blaisdell's home movie spfx extravaganza THE CLIFF MONSTER. 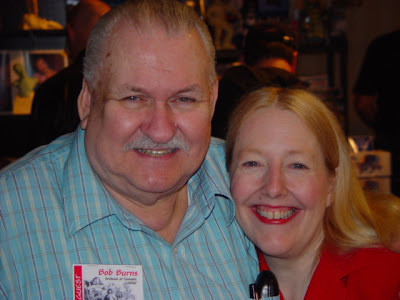 We saw and spoke with Bob's lovely better half, Kathy Burns, too, but failed to get a picture with her. 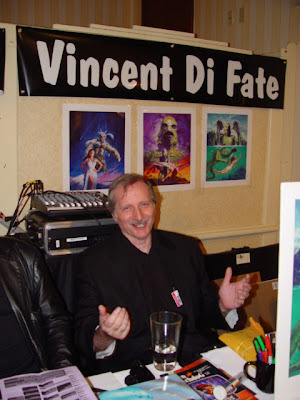 Here's Vincent di Fate, the celebrated cover artist of FILMFAX and past cover artist for CINEFANTASTIQUE, in whose pages we sometimes appeared together longer ago than either of us want to remember. A gifted artist, great guy, and now the proud owner of the original prop that lent its name to the first sci-fi movie he ever saw: ROCKETSHIP X-M! 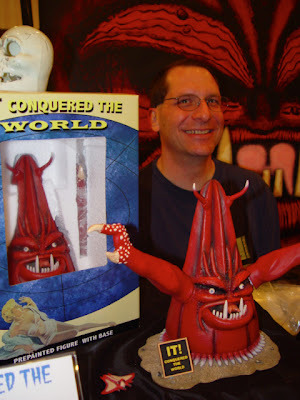 Here's our friend Paul Schiola of Ultratumba Productions, posing with his latest product sculpture, Beulah of IT CONQUERED THE WORLD. A talented and very personable man, with the biggest grin at Wonderfest. 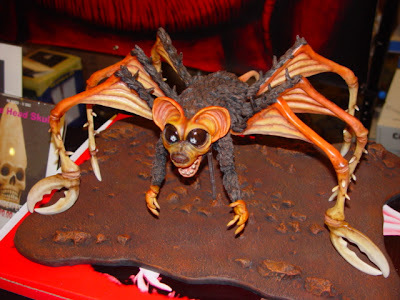 Also on display at Paul's table was this tres-cool replica of the unforgettable Rat-Bat-Spider-Crab from THE ANGRY RED PLANET. If you've got the display space available, go over to his website and score one of these babies. 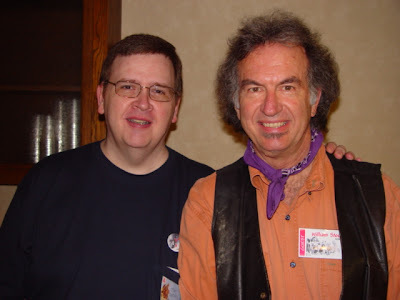 Here I am with another talented artist, William Stout. 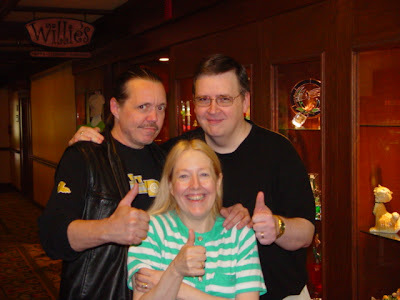 Donna and I enjoyed spending time with Bill up in Gary Prange's Old Dark Clubhouse, talking about the murals he is presently creating for a Natural History museum, his history as a cover artist for bootleg albums from Trademark of Quality, his devolopment of an amazing Oz theme park for Kansas City that never happened, and his current work on various Oz book projects. An amazing guy. 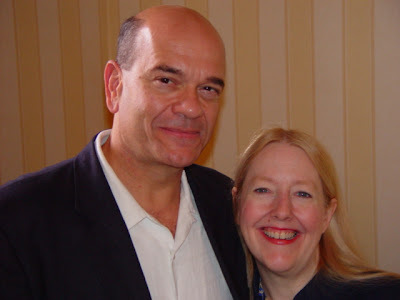 As long as I'm talking about cool people, I'll jump ahead to this Sunday shot of Donna and one of the show's Guests of Honor, Robert Picardo. 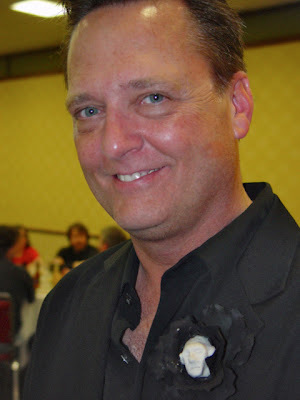 We had a great time talking with Bob about the gallery of memorable characters he's played for Joe Dante: Eddie Quist in THE HOWLING, The Cowboy in INNERSPACE, and his Karl Rove-surrogate character in MASTERS OF HORROR's "Homecoming." Later in the day, Bob sprang to the stage at the Sunday night banquet to steal the show. More on that later. 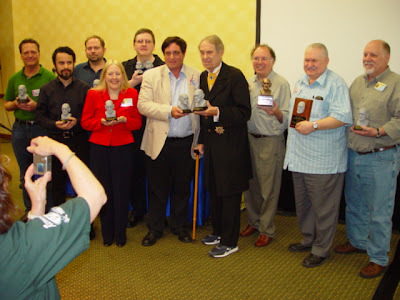 But now we cut to late afternoon on Saturday -- the Fifth Annual Rondo Hatton Classic Horror Awards presentation! 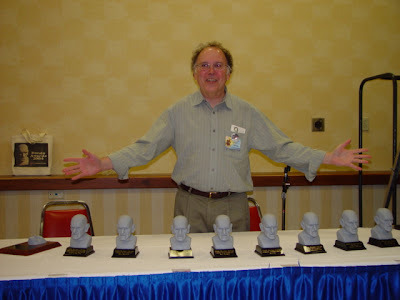 USA TODAY's David Colton -- the man behind the Rondos -- stands in proud control of the proceedings with the eight Rondo busts to be handed out at this year's ceremony. David brought with him this nifty canvas handbag. When I asked his wife Eileen Colton (staff photographer for CHFB News) if these were now being sold at the website, she said, "No... I ironed it on myself!" I think they may be missing a merchandising opportunity here. 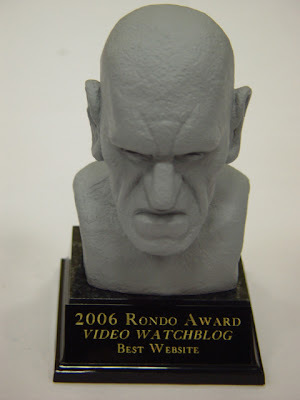 Before the festivities began, we snapped this close shot of the award that would soon be presented to me for Video WatchBlog -- an exclusive for you, the Video WatchBlog reader! 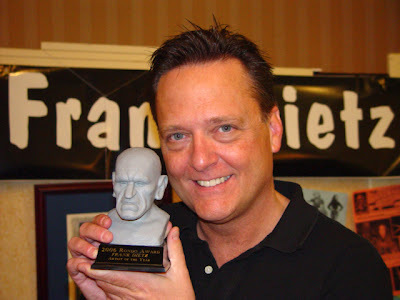 The show is now underway, with Kerry Gammill receiving his first-ever Rondo Award for this year's Best Book, THE FAMOUS MONSTER MOVIE ART OF BASIL GOGOS -- co-authored with J. David Spurlock. Donna and I took the stage to receive our fifth consecutive Rondo for Best Magazine. After five years, it's still a humbling experience. 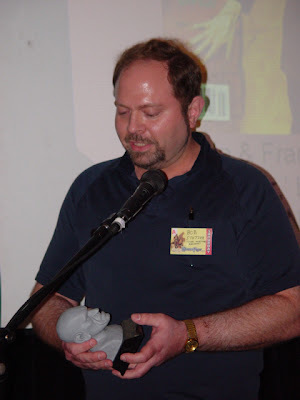 Bob Statzer then received his Rondo award for Best Article of the Year, his Karloff and Lugosi retrospective for SCARY MONSTERS. Way to go, Bob! 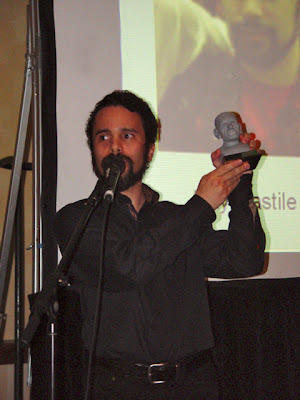 Here I am cradling the statuette I showed you earlier, as I thank everyone who supported me in my unprecedented win for Best Website, Video WatchBlog! 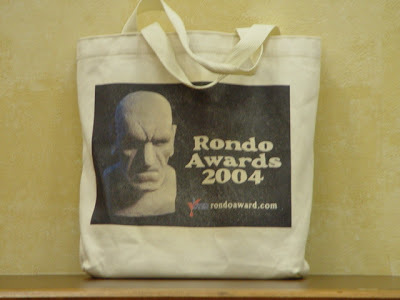 I later received a third Rondo, my first as Writer of the Year. In my speech (viewable at YouTube here), I thanked fellow scribe Tom Weaver (hoarder of all the other Writer of the Year Rondos) for keeping a relatively low profile this past year. 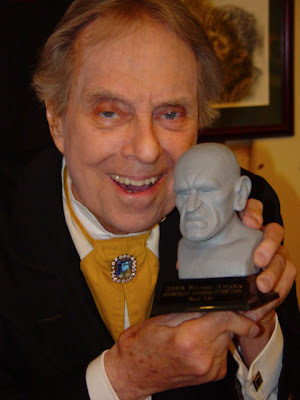 The one and only John Zacherle -- aka Roland aka Zacherley aka The Cool Ghoul, the greatest of all horror hosts -- rose to the occasion to accept his Rondo award for best CD, INTERMENT FOR TWO. Do you want to see more? Go here. 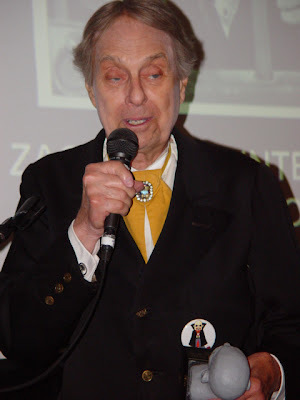 Donna took this great shot of Zach at his table on Sunday, where his Rondo award held court in the manner of his past SHOCK THEATER associate, Gasport -- finally out of the bag. I had met Zach in passing at a Chiller Theater show back in October 1994 and I'm so very pleased that our paths were able to cross again. He visited the Old Dark Clubhouse on Friday night with his biographer Rich Scrivani (whose book I loved, and whom I somehow failed to invite to be photographed with me, which I very much regret) and it was a treat to speak with Zach at greater length. Incidentally, my favorite Zacherley memory of the weekend: When Donna and I visited his table on Sunday, he asked us "Are you two committed to each other?" The question seemed at once full of Old World gravitas and contemporary correctness, and struck us both as very sweet and quintessentially Zach. We told him that we'd been married now for 32 years and he gave a low, delighted laugh and clapped his hands. I later told Donna that it had been one thing to be declared Man and Wife by our Justice of the Peace, but now I feel that our union has been blessed by Zacherley himself. 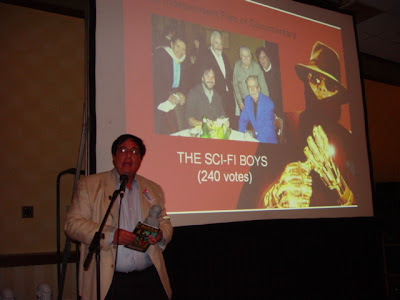 Filmmaker Paul Davids flew in from Los Angeles to accept his Rondo award for the year's Best Independent Film or Documentary, THE SCI FI BOYS. Paul got the room chuckling with his alternative universe explanation of Rondo's possible involvement in the writing of a classic Beach Boys song. 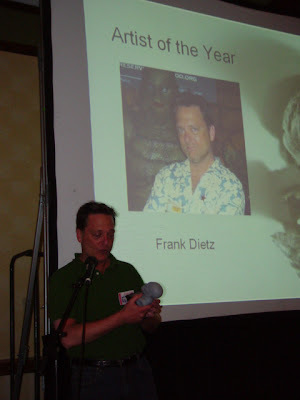 In one of the evening's most heartfelt acceptance speeches, Frank Dietz received his Rondo -- the first ever awarded in the new category of Artist of the Year. 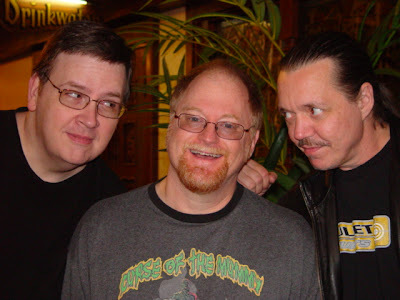 Eclipsing even Basil Gogos himself in the year when Gogos was the subject of the year's Best Book, Dietz accepted the award with warm tributes to his mentors Bob and Kathy Burns, Bill Stout, and Bernie Wrightson. Apologies for the dark shot, but Wonderfest needs to rethink the stage lighting for these events. You can view Frank's acceptance speech here. Here's a brighter shot of Frank and his new best friend taken at his table on Sunday. It couldn't happen to a nicer or more talented fellow. Over the weekend, I seized the opportunity to purchase my first-ever Dietz original: "Lon After Midnight," a 5" x 7" glazed oil portrait of Lon Chaney Sr. in LONDON AFTER MIDNIGHT garb, which became iconic in Frank's output when he used it as the key promotional image for his Rondo Best Fan Event-nominated oil painting exhibition of last year. 2005 Monster Kid of the Year Joe Busam passed the torch to this year's recipient, Raymond Castile. 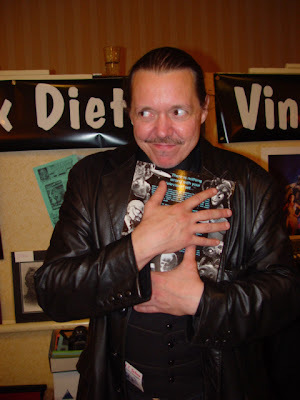 Ray not only masterminds the mind-blowing Universal Monster Army memorabilia display at Wonderfest, but was last year handpicked by José Mojica Marins himself to succeed him in the role of Coffin Joe! See it all -- Joe's induction speech and Ray's acceptance -- here on YouTube. 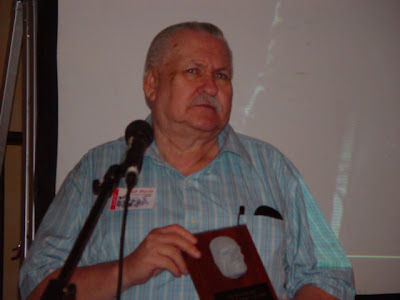 Bob Burns accepted a Rondo Hall of Fame plaque on behalf of his late friends Paul and Jackie Blaisdell, the monster makers for several AIP films of the 1950s, including DAY THE WORLD ENDED, INVASION OF THE SAUCER-MEN, THE SHE-CREATURE, and others. Bob concluded his bittersweet speech by announcing his intention to display the RHOF plaque in the Blaisdell room of his museum-quality memorabilia collection. "The wheels are off the wagon!" 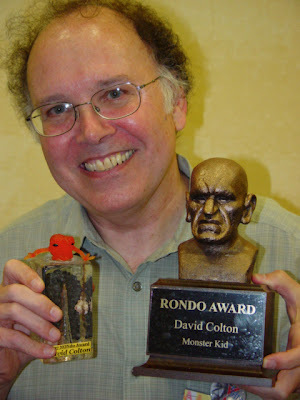 Host David Colton thought the awards were at an end, but as his delightful co-presenter Nurse Moan-eek (from Dr. Gangrene's CREATURE FEATURE) affectionately restrained him, David J. Schow grabbed the mic to profer upon Colton the world's first -- and perhaps only-ever -- Nondo Award. After that, John Clymer claimed the mic to present him with yet another honor, a Thank You to David from his peers. You Tube is hosting Jen Sorrels' camcorder footage of these presentations here. BTW, the voice you hear crying out "Oh, baby!" at the unveiling of the second award belongs to David's proud wife, Eileen. Here's David posing with both trophies. Or shall we say, "spoils"? With that, the photo opportunities began. 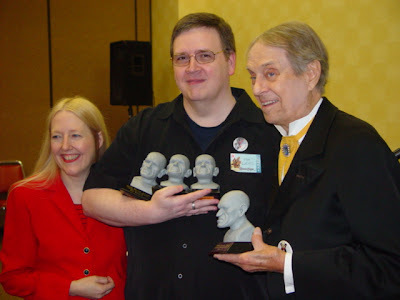 Here's Donna and I, proudly posing with our unprecedented sweep of three Rondos, but even prouder to be standing in the winner's circle beside our hero John Zacherley ("My, what a lot of awards you have there!"). Here's the lot of us, posing for at least a dozen photographers on the scene. This photo was taken with our camera by our friendly subscriber Ted Haycraft, who seized the moment splendidly. Thanks, Ted!!! And thanks to Jennifer Sorrels for the YouTube clips! 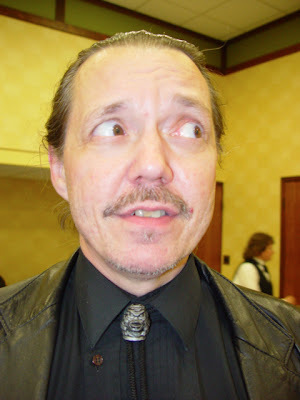 Also at Wonderfest this year were '50s sci-fi movie stars Lori Nelson and Kenny Miller and makeup artist Greg Nicotero. I had brief encounters with all of them, but unfortunately no pictures. Now keep scrolling down for more from Wonderfest! 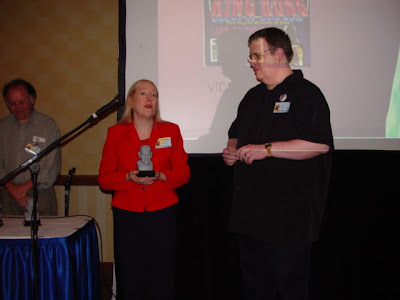 "Now you've got ME checking and I THINK I have eight -- four Best Writer, best book (MONSTER KID MEMORIES), best article (Donnie Dunagan), best article (Kay Linaker), best article (Bob Burns' New Zealand trip for KONG). So I've gotcha by ONE -- and am enjoying it while it lasts (which won't be long -- you'll take a commanding lead next year thanks to BAVA, I'm sure). PS - The world shall hear of me again!! Dr. Gangrene (Larry Underwood) and associate Frank Dietz investigate a coelacanth of their own between clips of the 1958 Universal-International favorite. Sorry for the dim quality of the image; Wonderfest needs to do something about their stage lighting. In between bouts of escalating mayhem involving special guest John Goodwin as "Dr. Princent Vice," the room rocks to the swingin' sounds of The Exotic Ones! Here's their drummer "Space Fink" turning their music into a minefield of traps and snares! 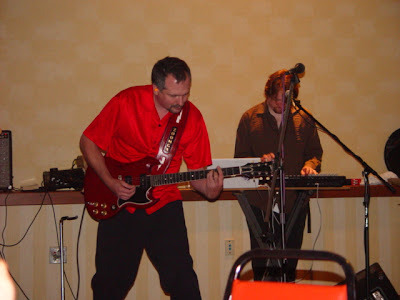 Lead guitarist "Zoomga" (or is that "The Tartan Phantom"? 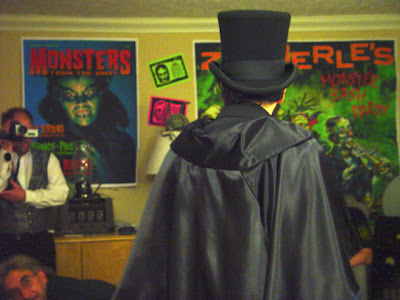 -- I always get 'em confused) lent his brain-melting licks to Zacherle favorites "Dinner with Drac" and "Happy Halloween," as well as Exotic originals like "B-9 Robot" and, of course, Gangrene theme song "The Doctor is In." Meanwhile, "The Purple Astronaut" vamps on keyboards. 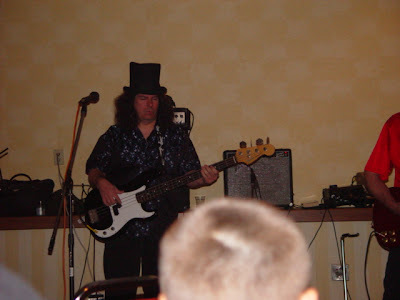 Bassist/vocalist "Mr. Ghoul" adds some bottom to the perilous proceedings as Bob Burns undergoes a terrifying transformation offstage. Had a great time talking with Mr. Ghoul in the Old Dark Clubhouse. Uh-oh! The Monster's got Nurse Moan-eek! 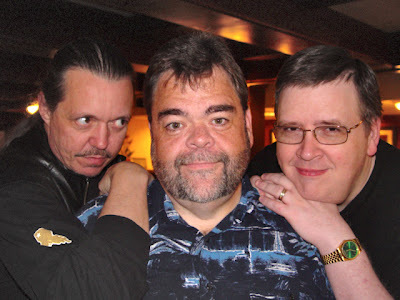 All ended happily, however, and I seized the opportunity to pose with my new favorite horror hosts. 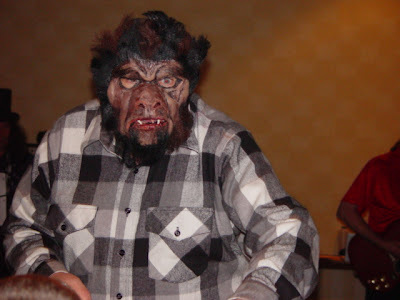 Dr. Gangrene's CREATURE FEATURE is presently airing quarterly on the CW Network. I've seen their first broadcast in this new format, featuring the Amicus film THE HOUSE THAT DRIPPED BLOOD, and it's fantastic and fully deserving of national exposure! You know what Monsters HD needs besides a more frequent turnover of new titles? A weekly horror host! Here's the team that could do it. 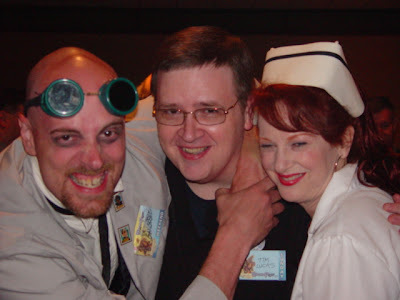 I got a chance to spend some time with Nurse Moan-eek (Linda Wylie) in the Old Dark Clubhouse and she's such a sweetheart! 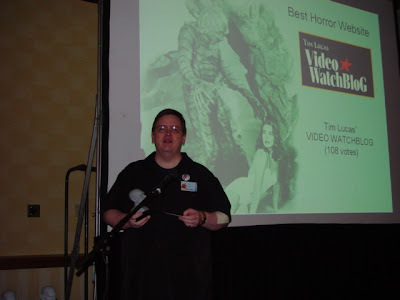 Not only is Linda an inspired comedienne -- I hope she'll continue to be part of the Rondo Award presentations in years to come -- but she's got an amazing positive energy about her that turns any room she enters into a happier place. 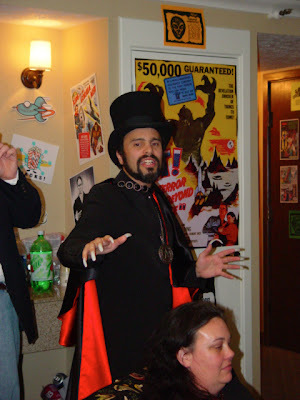 It was none other than the Brazilian horror icon Zé do Caixao, aka Coffin Joe -- a role originated onscreen by Jose Mojica Marins, but now passed on to none other than Rondo winner Raymond Castile! His eyes flaming with hatred for all humankind, his talons poised to deal out his own cruel brand of justice, he stalked among us, calling us "Rats!" ... faded into thin air! 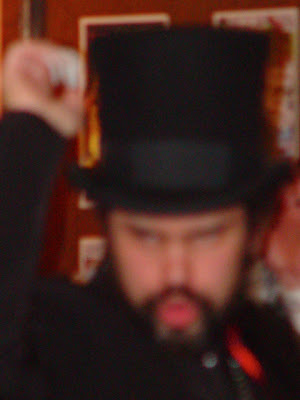 My camera caught his dissipating essence just before it evaporated from the room! Raymond got a huge round of applause for his performance, but he didn't stick around for it. Max had to lure him back to the room to take his bows, out of costume, and I gave him all possible praises. I've met Jose Mojica Marins and Raymond has nailed the character of Zé do Caixao perfectly. 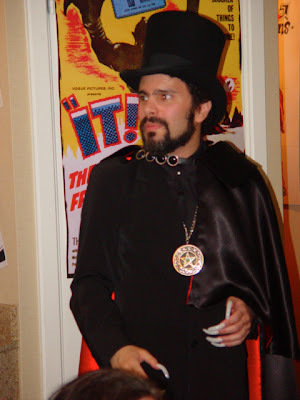 I also think his Zé costume is better than the original. 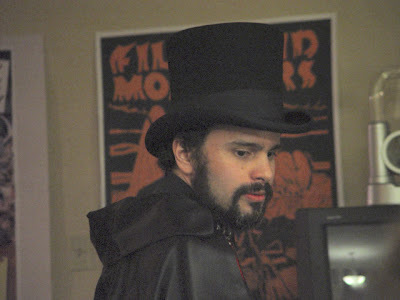 Raymond is starring with Mojica in the long-promised third part of the Coffin Joe trilogy as the young Zé do Caixao; his scenes have already been filmed, and I can't wait to see it. On Sunday, Donna and I attended David J. Schow's 16mm screening of the OUTER LIMITS episode "The Mutant," the one featuring Warren Oates as the mutant with fried egg eyes. I didn't get the resemblance as I was standing there, but check out this shot of Mr. Schow, which Donna took to capture Dave's handiwork with his homemade Gillman tie knot. But Mr. Schow wasn't the only Sunday night banquet celebrity to arrive in such sartorial splendor. 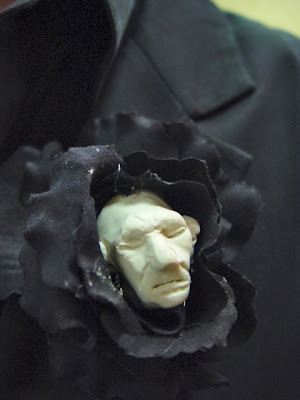 The ever-debonair Frank Dietz showed up sporting a special Rondo boutonniere, crafted by Dr. Gangrene's personal prop meister Ethan Black. The banquet had a Conan or barbarian theme because a couple of the artist guests, Gary Gianni and Mike Schultz, are experienced Robert E. Howard illustrators. Their presentations documented in images how other artists had inspired their approaches to their work, and the extent to which they relied on photographic templates -- fairly interesting, but the two lectures really couldn't compare to Dave Conover's talk on WAR EAGLES last year, or Kathy Burns' slide show of her and Bob's trip down under to participate in the filming of KING KONG. That's Donnie Waddell, of course, adding to the Sunday banquet festivities. 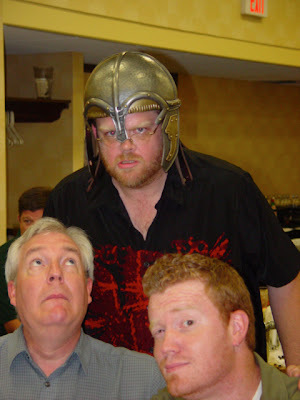 During the dinner, Dave Conover (as Grog) stomped around the room and grabbed pie off some people's plates and dunked it in other people's coffee. Here's Grog hovering over the heads (and plates) of 2005 Monster Kid of the Year Joe Busam and Joe Busam Jr.
Incidentally, like his father, Joe Jr. is an animator and he made use of the Old Dark Clubhouse to preview a computer-animated logo he's designed for Monster Bash, lovingly done in the style of the 1940s Universal spinning globe -- fabulous work! To be honest, this year's banquet festivities were a disappointment. 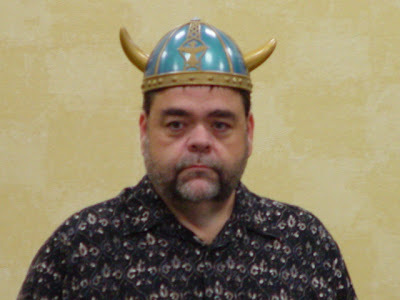 After the usual prize drawings and a couple of Conan art slide presentations by Gary Gianni and Mark Schultz, Wonderfest CEO and toastmaster Dave Hodge proposed that we all make bids to compel our favorite fall guys to participate in Karaoke humiliations for charity. Robert Picardo stole the show with a lyrically retweaked version of "I Got You Babe" that poked fun at Sonny and Cher's divorce, and Kathy Burns and Nurse Moan-Eek added cute choreography to a version of "Stop! 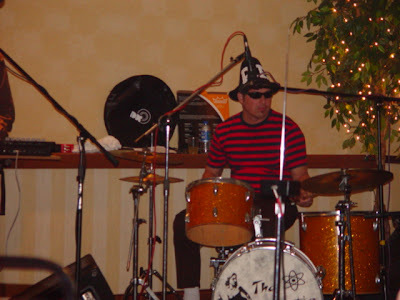 In the Name of Love" performed by Dave Hodge's wife (who clearly had never heard the song before), but it just seemed wrong to have Bob Burns, Donnie Waddell and Dave Conover tackle "The Monster Mash" when Zacherle himself was in the room. 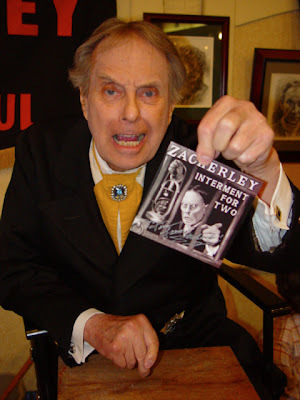 (Zach had actually proposed during Saturday's Shock Theater panel that everyone on the dais sing "The Monster Mash" as a tribute to the late Bobby "Boris" Pickett, but no one took him up on it. 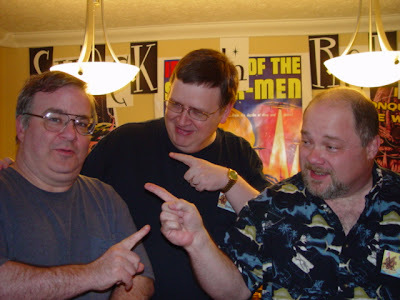 After the trio's admittedly silly rendition, I offered good money for Zach to step up to the mic and do it properly, definitively, magnificently, but he demurred.) By my count, the whole debacle was over after five songs. This is just my opinion -- shared by many, but still just my opinion -- but I feel the Karaoke for Charity idea failed for a number of reasons. One: the Wonderfest vibe is actually contrary to the stick-it-to-'em "fraternity initiation" vibe that Dave likes to promulgate at the banquets. Two: Wonderfest is pretty much a cash convention and, by Sunday night, everyone's coffers were much too spent to be properly charitable. And Three: we'd already paid for the banquet -- now we're supposed to raise additional funds for Dave's favorite charity? The Karaoke was a stinker, but it wasn't about to ruin anyone's evening. We pushed Sunday night as long as it could go -- closing down the Old Dark Clubhouse for the second night in a row and actually reconvening an ongoing conversation with Dave Schow, Harry Hatter, and Mike & Danya Parks in our room. I wish it could still be going on, but it folded around 4:00 am. By the way, I'd love to have a picture here of Gary Prange in the Old Dark Clubhouse, but he wouldn't move his can of pop away from his face when I tried to take one. Oh, what the heck! Here he is, ladies and gentlemen: Gary Prange! Kind of makes you want to remake THE BOOGIE MAN WILL GET YOU, doesn't it? Last person to be encountered on the way out the door -- most appropriately -- was the very emblem of the Wonderfest warm-'n-fuzzies, Donnie Waddell. DJS is in full YOU'LL FIND OUT mode here, but I just let my real feelings for Donnie show through. One of the nicest and funniest people in fandom. Our weekend flew past in a blur; Donna and I slept relatively little, going to bed later and rising earlier each day of the convention, as we tried to drink in more and more experience to remember fondly in the weeks and months ahead. And now it seems as though it all happened long ago, which I suppose is the work of these photographs, distancing me from a past that is actually quite recent. It's hard to believe that I was standing in the presence of some of these people only yesterday morning. All in all, a great weekend -- not a complete success, as I've said, but, in some ways, more profound than last year's Wonderfest. WHAT A WEEKEND Donna and I had in Louisville, Kentucky! This photo is a distillation of only a part of its wonderment, but what a heady draught! 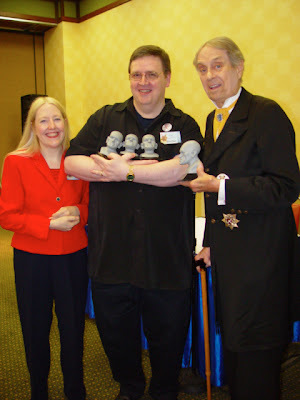 Here are Donna and I, our three latest Rondo awards (Best Magazine for VW, Best Website for Video WatchBlog, and Writer of the Year) gathered in my arms, and sharing the frame with us is the one-and-only John Zacherle, the 88 years young Rondo Hall of Famer, who was present to celebrate the 50th anniversary of SHOCK THEATER and to collect a Rondo bust of his own for his latest CD, INTERMENT FOR TWO. This is a moment in time we'll always treasure -- many thanks to our pal Ted Haycraft for capturing it!!! That's all the blog for now; I'm beat. But what are you waiting for? Go find a copy of INTERMENT FOR TWO and buy it now! It's a winner! Literally. Stay tuned: More Wonderfest memories in the days ahead.